And the performance has not even started yet. As the sound score begins, dancers come running through the audience into the space. The dancing feels familiar. It is exquisitely precise; it springs lightly and circles and swings, almost entirely vertical, and always with a particularity that feels both powerful and measured. At first I think that the familiarity of these vocabularies feels generic, then something happens: I notice the spatial pathways of these dancers, juxtaposed over and against the lines drawn on the floor and walls. They move with precision, yet it is precisely not the paths traced out along these lines. Between the “territory” of these highly organized bodies—organized both in the clarity of the choreography, but also in the evident regulation of their training—and the tape, the lights, the demarcation of the Marley floor space, the architecture, I falter. These frameworks or systems of organization (or, again, territories) each provide a way to see and structure the space, and they do not align. They do not operate through the same logic, and thus they continually cleave through one another. Bodies fall into temporary lines with one another, but they are lines that intersect and extend through other lines (light, tape, Marley, cement, flags) in the space. In this sense, what seems familiar or even generic takes on new, unexpected properties. The movement—however familiar it might feel—enacts an unfamiliar operation in the disruption/deterritorialization of other versions of the space, and in doing so, makes the movement itself no longer what it might have seemed to be. Space is not the only element that is produced through these various forms of organization: these bodies, as bodies do, are moving in/through time. Their movements repeat, and the rhythms of their repetitions segment time, as does the music, and the time produced through the movement of bodies and the repetition of those movements is not always the same as the time that is produced through the complex rhythmic structures of the sound score (composed by Hahn Rowe). These temporal territories deterritorialize one another (or, at the very least, suggest routes—”lines of flight”—along which deterritorialization might be accomplished), and in doing so, I brush up once again with that from which time becomes. Somewhere between time and space, I encounter the alignments of bodies: dancers coming into synch with one another, sometimes in brief or extended unison, sometime in shared timing of different gestures, sometimes in shared or similar vocabulary that is not in synch with one another. [William Forsythe and Norah Zuniga Shaw define “alignments” usefully in their introduction to the Synchronous Objects project: “Alignments are short instances of synchronization between dancers in which their actions share some, but not necessarily all, attributes. Manifested as analogous shapes, related timings, or corresponding directional flows, alignments occur in every moment of the dance and are constantly shifting throughout the group.”] In these moments of alignment between bodies, fleeting territories emerge, briefly establishing logics capable of holding these dancing bodies together, traversing other configurations of time and space, while also interrupting the clear/stable individuation of bodies on stage. 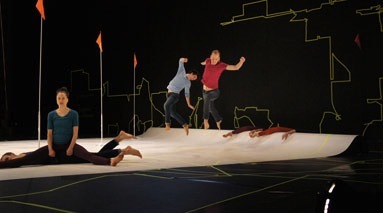 At a pivotal moment in the piece, the performers distribute themselves across the stage, pulling up the fluorescent orange tape that has traversed the white Marley throughout the performance. This is the first time that these bodies have moved along these lines, taking on the organization of these marks, but they do so only within the very moment that they become unmarked. This is breathtaking, the mundane task of pulling up tape demonstrating something of becoming unmarked/disorganized/smooth in the very moment of reiterating/retracing the given marks. I think of Judith Butler’s suggestion that the opportunity for the subversion of performative regimes is in the repetition of those very performatives. The repetition is the site of agency, the point at which the doing can become undone. The strips of tape peel and snap off the floor, into the air, and are rolled into great balls. So much happens in these moments: following these lines, the lines become undone; the two-dimensional moves suddenly through the air, three-dimensionally, and coheres as haphazard clumps. The linear formations are made to break with their own logic, rapidly transitioning into new states, themselves becoming the tools for their own deterritorialization. Something similar happens with the standing flags throughout the piece: at various points, dancers reconfigure these flags, and in doing so, simultaneously produce new [organizations of] spaces while undoing the spaces that had been described by the flags only moments earlier. These are the mechanisms of the piece, these various structures intersecting and undoing one another and themselves. But throughout it all, there is the suggestion of something more, something beyond, what Grosz calls “chaos”: “Chaos is not the absence of order but rather the fullness or plethora that, depending on its uneven speed, force, and intensity, is the condition both for any model or activity and for the undoing and transformation of such models or activities. This concept of chaos is also known or invoked through the concepts of: the outside, the real, the virtual, the world, materiality, nature, totality, the cosmos, each of which is a narrowing and specification of chaos from a particular point of view. Chaos cannot be identified with any one of these terms, but is the very condition under which such terms are capable of being confused, the point of their overlap and intensification” (Grosz 26-27). In Canyon, this chaos is most articulate to me in that which is beyond, that which is out of bounds, out of reach, out of sight, off balance, just beyond what is accounted for within the available logics of time and space and bodies, just beyond what is demarcated by the choreography, the lights, the floor, the visual designs, etc. The beyond/chaos operates constantly at the edges of the territories, and I catch glimpses of it in their mutual disruption, but it is perhaps physicalized most overtly in the ridge on the floor at the edge of the performance space: the Marley floor takes on a kind of topographical elevation, inclining upward into a short roll near the far “upstage” edge (see photos). Throughout the performance, dancers and objects move over this ridge to disappear behind it. Quite literally, we were shown where visibility ends and unseeable/unforeseeable possibilities exceed both the visible as well as the floor space. Similarly, dancers frequently enter and exit the space through the audience seating, simultaneously extending the “performance space” and—depending on where one was sitting—crossing out of sight. In these moments, I became keenly aware of what was beyond this organization—“the performance”—and the liminal space at the margins of what is included within the time/space of the performance. This was for me the ongoing brush with chaos between and beyond the intense proliferation of organization(s) within the work. Finally, this sense of “the beyond” is articulated throughout the dancing bodies of the work. Time and again, dancers (Lindsay Clark, Kennis Hawkins, John Jasperse, Burr Johnson, and John Sorenson Jolink) perform at the edges of their balance (there is a lot of stumbling in this piece), at the edges of unison, at the edges of alignment, at the edges of clear geometric spatial formations, at the edges of stability; frequently, they fall or spill or are thrown or slide into this “beyond,” into excess, off balance, no longer fully in control, not quite in unison, no longer in a straight line. I love the moments of the dance in which the dancers seem to to drift and wander, with drifting foci and limp bodies, somewhere between intoxication and a dream stake, a kind of a wandering about wonder that does not clearly define its trajectory, that does not rigidly contain these bodies. The limits of clear organizations/structures/territories—again, of balance, of unison, of alignment, of spatial formations, of stability, etc.—are explicated through these excesses. This is what lingers with me as the night wears on: the sense of what exists just beyond how this moment is structured, the specter of chaos as the rich, full ground from which territories—those various ways in which my body, this space, this time, my sense of self, my geographical situation, etc. etc. etc.—take on precarious constitution. This is not to disparage organization or structure or territory; these are the strategies through which we navigate our experience and our worlds; these are the strategies with which dances—all art, in fact—are made. Rather, there is a quiet hopefulness in the lingering effect of Canyon, an awareness of the conditionality, contingency, and precarity of such structures, a persistent sense of what exceeds these frames, of hovering at the edge of what else (and how else) might be possible, between and beyond. Cited: Grosz, Elizabeth. Chaos, Territory, Art: deleuze and the framing of the earth. New York: Columbia U P, 2008.